Nebraska takes on Michigan Thursday night in Ann Arbor in a battle of two teams near the middle of the Big Ten standings. Both are 5-6 in conference play, though Michigan had more success in the nonconference than Nebraska did. It’ll be a rematch of the conference opener for both schools, a meeting Nebraska took 70-56 at Pinnacle Bank Arena thanks to a 33-13 fourth quarter explosion. Michigan was hot when these teams first met, but since, the Wolverines have cooled. Tip-off is set for 6 p.m. CT on BTN. Here are three things to know for the matchup. Right now, the Huskers are being powered by guard play. Junior point guard Hannah Whitish has been tremendous for Nebraska of late, both in distributing the ball and finding her own offense. She has scored in double-figures in six straight games and during that time has averaged 15.3 points on 43.8 percent shooting from 3-point range and 5.7 assists against 2.0 turnovers a night. The last time Nebraska was on the road, Whitish erupted for 28 points (with a career-high-tying six made 3s) and 12 assists (a career-high). Her backcourt partner in the starting five, Nicea Eliely, has been just as good, but she’s doing her damage on the defensive end of the floor. She’s still averaging seven points a game but contributing 2.5 steals and 3.8 rebounds. 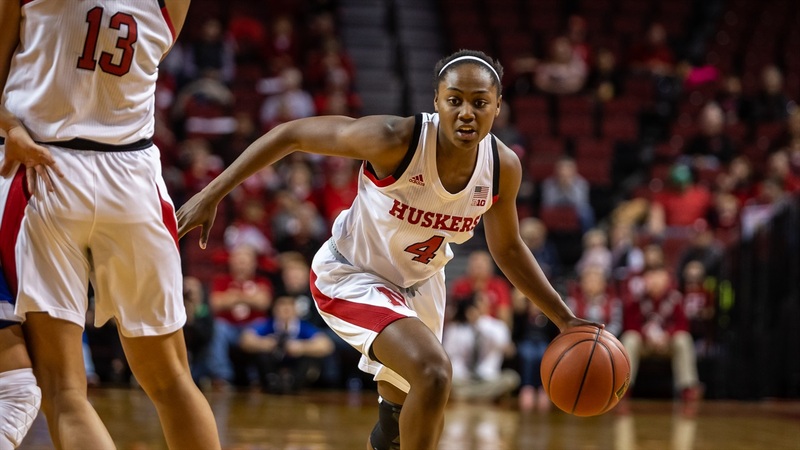 Eliely has become Nebraska’s defensive stopper and, save for the last outing against Indiana, has able to consistently avoid fouling while defending. Then freshman combo guard Sam Haiby comes into the game and brings her blend of scoring and playmaking with her. Head coach Amy Williams has mixed two-point guard lineups that feature both Haiby and Whitish on the floor as well as lineups that allow Haiby to be the primary ball-handler. She’s coming off two of her best games as a Husker — 13 points on 5-of-7 shooting in 17 minutes against Purdue and 17 points on 5-of-8 shooting in 22 minutes against Indiana — that helped earn her a share of the Big Ten Freshman of the Week award for last week. Haiby also went for 16 points in 19 minutes in the Jan. 20 win over No. 23 Minnesota. In recent performances, Haiby seems to be settling into her role and looking to attack more off the dribble rather than settling for outside jumpers. She’s shooting 29 percent from 3 on the season but has only taken five in her last four games, including a 3-of-4 performance against Purdue. Michigan is second in the Big Ten in rebounding margin at plus-8.5 largely because they attack the offensive boards like few others in the conference. Only two other schools average more offensive boards each night than the Wolverines (14.5). Michigan is also eighth in turnovers per game yet manages to rank third in turnover margin (plus-1.4). When the Huskers travel to Ann Arbor, the team that will be there waiting for them is a very opportunistic outfit. The Wolverines are led by a senior post player (Hallie Thome) who bangs down low. They neither take nor make 3s at a high rate (31 percent shooting, 10th in the league; 15.2 attempts, 11th in the league) and they’re one of the worst free-throw-shooting teams in the Big Ten (67 percent, 12th). If the Huskers can control the second-chance opportunities and keep Michigan from turning them over, they could be in good shape. When these two teams met in December, Michigan outshot the Huskers and lost by 14. Nebraska hit nine of its 24 triples (Michigan made 2-of-10), won the turnover battle 15 to 23 and held the Wolverines to seven offensive rebounds and three second-chance points. In conference play, Michigan has a minus point differential. Single-shot possessions for an offense that relies on 2s doesn’t match up well with Nebraska’s perimeter-oriented approach if the Huskers, who take more 3s than anyone, can hit at even their normal rate. Keeping Michigan from creating extra scoring opportunities is the recipe. Nebraska has two star freshmen, Michigan has two star freshmen. Haiby’s co-Big Ten Freshman of the Week honor was shared with Michigan forward Naz Hillmon. The Cleveland, Ohio, native has been Michigan’s most explosive player this season, averaging 12.7 points and a team-best 6.7 rebounds despite playing only 22 minutes per game. She’s shooting 67.4 percent from the field and she’s a four-time Big Ten Freshman of the Week. But, she’s picked up more fouls than any other Wolverine and turned it over four times against Nebraska the first time the two sides met. The other duo is linked by more than just their class. Reserve wing Leigha Brown was runner-up for the 2018 Indiana Player of the Year award following her senior season at DeKalb High School. She lost out on the honor to Michigan starting guard Amy Dilk, a Carmel, Indiana, native. While Brown is averaging 10.3 points in 19.2 minutes in league play for the Huskers, Dilk is averaging 9.1 points in 35.5 minutes a night for the Wolverines. Both get their offense in different ways. Brown is a jump-shooter while Dilk serves as the Wolverines point guard. She leads Michigan in assists (5.2 in league play) and has only taken eight 3s in 11 conference games. While Haiby could end up guarding Dilk at any given point, Brown most likely won’t draw the intial Hillmon assignment. Senior forward Maddie Simon or one of Nebraska’s bigs will likely do that. Still, look for Nebraska to seek out Hillmon on the defensive end and try to isolate her in one-on-one situations and put her in foul trouble.